A Sermon for Epiphany: Where is He? 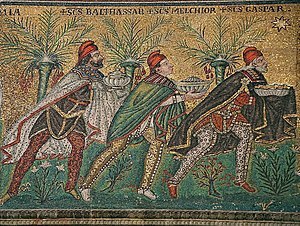 Here is a sermon from my archives on the journey of the Magi. It includes a shortened telling of Henry Van Dyke’s The Story of the Other Wise Man, along with allusions to Matthew 25:31-46. The new light in the heavens was enough to set the wise men on a long and difficult journey. They journeyed hundreds of miles to Palestine from the east, from the area we now know as Iraq and Iran. The wise men studied the stars. They knew all the cycles of the moon, all the courses of the stars, all the constellations. They believed that this new star could only point to one thing: a new and great king had arisen somewhere. The king of kings had arrived. We do not know how they determined that Palestine was the location. Perhaps they calculated it from the coordinates of the star. Perhaps they had heard the messianic prophecies from the many Jews whose ancestors had not returned home to Israel after the exile of 587 BC, who now still lived in what used to be Babylon. Perhaps a number of clues led the wise men to Jerusalem. It’s clear that they were extraordinarily open to being led. Going straight to the heart of Judah, the capital city, Jerusalem, they immediately started asking directions. “Where is the baby born to be the king of the Jews?” It made sense to ask there. You want to find royalty? Go to the place of royalty. I don’t know what made the wise men so eager to find Jesus. But I do know what makes our hearts long to see him, why we long for the Savior. Our prayers are full of the longing: for help and healing, for a sinful past not to destroy the future, for peace in our hearts and peace in the world, for a star to guide us through every uncertainty. The Christmas story thoroughly engages the imagination. When we imagine the scene in Luke of shepherds seeking and finding the newborn in the manger, with angels hovering, and when we imagine Matthew’s story of the wise men bowing low with humble joy, it is possible to forget. It is possible to forget—just for a little while—that there is another terrifying presence in this story, a malevolent presence that would like nothing better than to destroy the child. But the Christmas story in the book of Revelation will not allow us to forget it. There the story is anything but peaceful and serene. The mother is crying out in hard labor. And crouched in front of her is a huge red, seven-headed dragon, ready to spring and devour the child as soon as it is born. Believe it or not, this really is a vision about the birth of Christ—and, as we’ll see—about his death and his resurrection and his ascension. The child is the Messiah, the Anointed One, the Savior. He is born to Mary, of course. And he is also born to Eve, the mother of all living, whose children tread on the head of the snake. And he is also born to Israel, to the people of God, who shine as twelve stars in the mother’s crown. 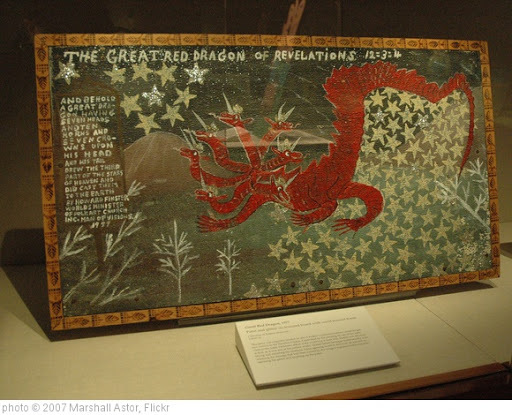 The dragon is the ancient serpent, says John, one and the same as the snake we first met in Genesis. It is Satan, a word that literally means the adversary of God. It is the devil. It is the accuser, the one who points at God’s children and laughs and laughs and declares over and over again, “Guilty! Guilty! Guilty!” It is the great deceiver of all humanity. This is no silly looking devil in red tights. This dragon is everything evil all rolled up into one great malevolent force. It is the worst monster you can imagine, covered with heads and horns and crowns that John and his first readers would recognize as symbols of its power. This dragon is crouched, eager to devour all the children of Eve, and even more eager to devour THE Son, the one who can save all the rest. And in every age it has raised up terrible monsters to do its bidding. Think of the beasts in power when Jesus was literally born in Bethlehem, and in particular the beast named Herod. He was more than troubled when visitors from the East informed him that somewhere out there lay an infant, born to be king of the Jews. What did Herod do? He reached into his same old bag of tricks. Here was a monster who had three of his own sons murdered, and one of his wives, and any number of his administrative people. Herod’s response to the birth announcement? Plot murder. That child must be devoured! “Go find the baby,” he directed the visitors from the East, “and bring me word, so that I can go and worship him, too.” Herod sent them after names, addresses, physical descriptions. Would the wise men get caught up in the dragon’s doings? Herod was one in a long line of agents of the dragon. The line stretched back to people like Pharaoh, king of Egypt, who enslaved all the Israelites, who ordered all Israelite boy babies to be murdered. And there was Nebuchanezzar of Babylon and his fiery furnace. As Jeremiah the prophet put it in chapter 51, the inhabitants of Zion, Jerusalem shall say, “King Nebuchanezzar of Babylon has devoured me, he has crushed me, he has swallowed me like a monster…” And there was Darius, king of the Medes, and his pit of devouring lions. History is full of these characters. 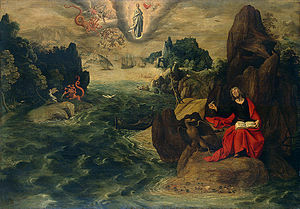 In John of Patmos day, Rome was a great beast and its emperors agents of the dragon, bearing names like Caligula, and Nero, and Domitian, and under them, Christ’s children paid for their faithfulness to him. They were despised, rejected, denied economic opportunity, and yes, at times, literally devoured by wild beasts. In every age, the dragon has its agents. In our living memory, they have borne names like Hitler, Stalin, Pinochet, Milosevic. And don’t forget all the non-famous people that do the dragon’s bidding, preying on others, making life miserable for others, gobbling them up economically or emotionally if not literally. The dragon doesn’t always roar, though. The ancient serpent is always crouched nearby. It slithers into every heart, where it drums up arrogance, hatred, cynicism, destructive thoughts and attitudes of all kinds. “I’m not the problem,” its victims say. “Its those other people those people who…” you fill in the blank. The dragon loves to get people thinking that way. It smacks its lips. And it knows that even if these people don’t actively support the big monsters, they can easily be persuaded to look the other way. Here is the sermon I preached on Christmas Day last year. It points out the great contrast between the king who slept in the animals’ trough in Bethlehem and the king who slept in luxury in the palace in Jerusalem. Herod wielded the power of wealth, and he wielded the power of fear. To get rid of all possible challengers, he spilled blood and more blood. He even had several members of his own family executed. Fights went on over who Herod’s successor might be, but of course there could be no successor except the one he chose. As powerful as Herod was, an even greater power loomed above him. The Roman Empire had put Herod where he was. The emperor could flick him off like a flea, but he proved useful. 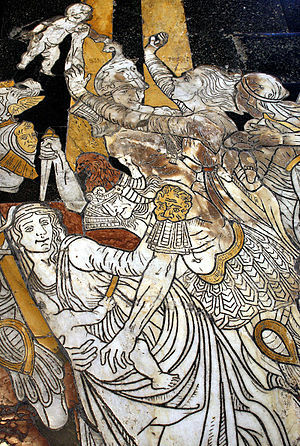 Rome extracted resources from all the peoples it had conquered and controlled its holdings through threat and fear. Herod was part of that enterprise. And one of Rome’s weapons against any who might rebel was the cross. Down below Herod’s palace lay the little town of Bethlehem. Its name meant “house of bread,” and its bakeries may have supplied Jerusalem a few miles away. It was a town of ordinary, working class people who lived in simple dwellings. Up in the Herodium, Herod had lots and lots of rooms, including a 900-seat theater. But most of them had only two or three. They kept their animals in shelters attached to their homes. Sometimes these were caves down under the main living quarters. The people of Bethlehem were doing their best to get on with living under the shadow of the Herodium, and of the cruel King who built it, and of the empire that stood over him. And they were longing for something better. Longing for something better just like the prophet Micah and the people of his day, when it was the Assyrian empire extracting money from Judah. And the rich and powerful passed the cost right on down to those who could least afford it. Sounds familiar. Micah declared, “Out of you, Bethlehem, yes you, shall come a ruler who will feed his flock in the strength of the Lord, and they shall live securely, and he shall be the One of peace.” What a contrast this ruler would be! And he was on his way, Micah said. A young woodworker named Joseph who hailed from Bethlehem had recently returned there to be registered for a census ordered by the Roman Emperor. Once again Rome was jerking the chains of the people it held. It was the worst possible time to make this trip. Joseph’s fiancée, Mary, was in the final stages of pregnancy. It is hard to imagine a more miserable journey. Nine days of hard travel on top of the many late pregnancy discomforts Mary was coping with. When they arrived, the town was full of extra people there for the same reason they were. It was a struggle to accommodate everyone. When she went into labor, it was a struggle to find a place for Mary to give birth. The only available space was in the animals’ shelter. Scholars think that about twenty children were murdered in and around the village of Bethlehem by order of Herod. Today, December 14, 2012, twenty more were murdered, along with some of their teachers, in Newtown, Connecticut. Here is a repost of a sermon I wrote on this text years ago for the first Baptism of the Lord Sunday after 9-11. When will Rachel be able to dry her tears? One person can cause unbelievable amounts of pain, especially if a few people cooperate and a lot of people look the other way. No wonder all Jerusalem was disturbed when the Wise Men brought the news of a baby King of the Jews. All Jerusalem knew what King Herod was capable of if he felt there was the least threat to his position. Already he had ordered the execution of one of his wives, her mother, several of his sons, three hundred of his court officials, and countless others. Later, shortly before his death, Herod ordered the imprisonment of a number of the most distinguished citizens of Jerusalem. At the moment of his death, all these innocents were killed, so that there would be weeping and wailing in Judea. Herod was well aware that no one would mourn his passing. What did the lives of the children of Bethlehem matter to Herod? Compared to the rivers of blood he had already spilled, what did he care about the blood of the twenty or so infants and toddlers that lived in the village? When the Wise Men failed to return with the intelligence Herod needed to zero in on Jesus, he ordered his soldiers to search out and destroy every child in Bethlehem age two and under. Jesus would surely be among them. In a dream, Joseph received a warning about this evil plan. In a flash he was up, waking Mary, and hurrying to pack a few essentials. There was no time for more. In the dead of night they slipped away as quietly and as quickly as they could, leaving everything behind. Now they were refugees. Now they would have to find a way to survive in a strange land. Joseph would have to start all over again: find food, find shelter, find work. Jesus’ earliest memories would be not of home, but of Egypt. Soon there was weeping and wailing all over Bethlehem. That’s what happened in Bethlehem. A voice was heard in the land. It was Mother Rachel weeping and wailing because her children are no more. On September 11 a voice was heard in this land, crying out for the thousands of mothers’ children who are no more, because of the likes of Herod now—joining the cries around the world for millions of refugees and millions of mothers’ children who are no more, because of the likes of Herod now. In the Sudan. In Kosovo. In Rwanda. In Palestine. In Israel. In Afghanistan. In the United States. 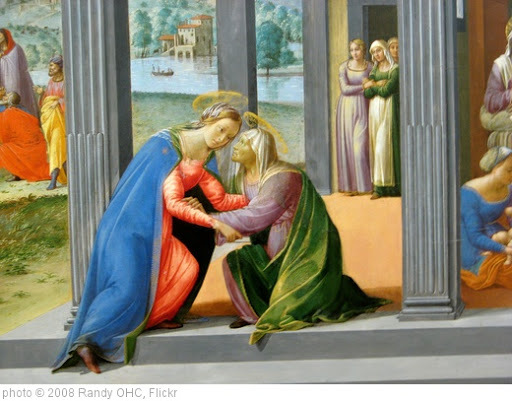 Here is a sermon about Mary’s visit to Elizabeth. It looks at why we need a family of faith and why it is best not to try to be a lone ranger Christian. How welcome Mary’s presence was to Elizabeth. After years of unanswered prayers and living with the pain of infertility, suddenly, in her old age, Elizabeth was pregnant! Nobody but her husband, Zechariah, knew it, however, nor knew that this child, John the Baptist, was destined to herald the coming of the Savior. For five months Elizabeth stayed in seclusion. In spite of the wonder of her news, she was largely alone. It was not even possible to speak openly, at length, about it with her husband. Zechariah, remember, had been speechless ever since he received the angel’s news of John’s impending birth. He had been reluctant to trust the promise, and so the angel told him he would be mute until after the birth. This meant that Elizabeth seldom if ever heard the sound of another human voice for months. Imagine the isolation! How welcome Mary’s coming was! How joyous her arrival! How good it would be to hear another human voice! Elizabeth was a welcome sight to her young kinswoman, Mary, too. Mary herself was in the early stages of an unexpected pregnancy, and it wasn’t problem-free either. Things weren’t happening for her in the order they were supposed to happen. Teen-aged Mary was promised in marriage to a man named Joseph, but they weren’t married yet. As we saw last week, Mary was perplexed at the angel’s announcement. “How can this pregnancy be?” she exclaimed. “It will be by the power of the Holy Spirit,” God’s messenger answered. Mary then said “yes, let it be” to the call, but many unanswered questions remained. What will Joseph think? What will the neighbors think if they notice her looking a little queasy, or notice her figure begin to grow round in the typical way? And how should Mary raise this child? What did she need to do to help him get ready for his mission? If her own calling was big, her child’s calling was awesome! Mary didn’t go into seclusion, however. She didn’t stay home alone with the questions. Mary got ready as quickly as she could, and hurried on a journey of many miles from Galilee to Judea to visit Elizabeth. How good it was to lay eyes on Elizabeth, someone who was kin to Mary physically. But even more they were kin spiritually, kindred spirits. Of all people, Elizabeth would understand what was happening to Mary. Elizabeth understood this business of being called by God—both the blessings and the problems that come with God’s call. What a blessing to be understood! What a blessing to have some company. Why don’t people come to church? Why don’t people come to church? That’s a question that’s much on the minds of the folks in our congregation who do come to church every Sunday they possibly can. We wonder why some people are content to come every once in a while. We wonder why some never come at all, and don’t want to come. Well, there are many reasons why people avoid church. 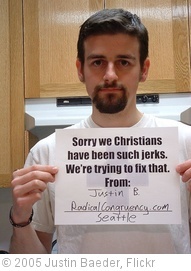 But being turned off by what they have seen of Christians personally and in the media is certainly one big reason why many people don’t want to have anything to do with church. To welcome and love people, we have to get involved with their lives and let them get involved with our lives. It’s about building loving relationships. Read the whole post. It’s really challenging. Have mercy on your church, Lord Jesus. One Saturday night in early June the Morton congregation gathered to honor our most recent high school graduate, my daughter, Laura. As they do for all our graduates, the Presbyterian Women asked Laura what she would like to have on the menu, and she asked for chicken pastry, a local favorite, and whatever covered dishes people wanted to bring. Laura is an artist, so the women turned the fellowship hall into an art gallery showcasing Laura’s work from toddlerhood to now. People stood and told Laura what she means to them, wished her well, and promised to pray for her as she goes forward through her studies at Guilford College and beyond. One of our ruling elders presented her with a study Bible inscribed from the congregation. Mine weren’t the only eyes that were overflowing. I could barely get the words out as I tried to tell the congregation how much their loving, active support has meant to Laura, my husband, John, and our family through the years, starting on the Sunday a few months before her birth when I stood beside the baptismal font and told them that we would soon need to use it because we had a baby on the way. In the years to come, Laura will remember the Morton saints and what they have taught her about love and compassion, and service and justice and righteousness. She will remember serving alongside them in ministry. I am so glad that she has grown up knowing and observing these folks over a long period of time. I had that experience in the small church where I grew up, and I still remember the lessons I learned from those saints. I still want to be like them. Many of them have finished the race, and I look forward to a glad reunion with them one day. I asked another grown-up child of Morton Church what this experience has meant to him. Andy is now a Ph.D. candidate in chemistry at a university in California. He said that he has taken all the Morton saints with him. They–we–go with him as he moves through life. When our grown-up children come home, we love to bless them all over again and send them back out on whatever missions God has for them. I wish every child could have an experience like this, to grow up knowing a number of strong mothers and fathers, grandmothers and grandfathers, sisters and brothers in the faith. I wish every child could have a graduation party like the one the church gave my daughter. I wish every child could experience God’s love in this way. Next year we’ll be celebrating Elizabeth’s graduation, and once again, we’ll need to make sure the kleenex box is on hand. Friends, if someone tells you that small churches don’t have anything to offer children, I invite you to join me in begging to differ. Small churches of loving, committed people can be just the cloud of witnesses that children need to grow into loving adult disciples of Jesus Christ. Thank you, Morton Church! Thank you, God!